Good Afternoon- I want to congratulate all of you who are here for this important rally and I wish that I could be with you in person. It was just a year ago that I was proud to stand with Rebiyah Kadeer and nearly 200 members of the Uyghur community as we stood in the rain outside the Chinese embassy demanding freedom for their imprisoned family members in East Turkestan. Sadly, in the intervening year the situation for the Uyghurs of Xinjiang province has only become even more dire. The world is gradually waking up to the reality of the mass incarceration of over a million member of the Uyghur community in so called “re-education” camps but we know them by another name. These are concentration camps where innocent men women and children are subjected to abuse, political indoctrination, torture and worse. There is simply no similar case of mass incarceration being perpetrated against a peaceful community anywhere in the world today. But China’s abuses against the Uyghurs of East Turkestan go beyond the concentration camps. The entire province is being turned into a vast surveillance cage in which virtually the entire population is trapped. The cities are covered with surveillance cameras, mandatory collection of DNA is enforced across the population, mosques are monitored, children are interrogated and neighbors are pressured to “inform” on neighbors. It is like a nightmare out of a dystopian futuristic novel and yet this is the frightening reality in which millions of Uyhgurs live. The Chinese government has set out to systematically eradicate the culture, religion and traditions of a proud people and it is time for the world to stand up and say, THIS WILL NOT BE TOLERATED. The Uyghur Human Rights Policy Act is a vital first step toward securing basic human rights for the Uyghur people and holding China responsible for its abuses. The Act would create positions within the State Department, the FBI and the CIA to investigate the full extent of China’s anti- Uyghur policies and to recommend steps the US government can take in response including imposing sanctions under the Global Magnitsky Act. We are sick and tired of the free world engaging in “tip-toe” diplomacy when it comes to China. We must not be intimidated into silence simply because China uses its economic clout to try and quiet criticism of its appalling conduct. If we want to demonstrate that we have a genuine commitment to basic human rights we must take a stand, loudly and clearly on behalf of the Uyhgurs of East Turkestan- and that is what today’s rally is all about. The Lantos Foundation was proud a few years ago to honor Ms. Kadeer with our highest award- The Lantos Human Rights Prize. As the acknowledged “Mother of the Uyghur Nation” she has been courageous and tireless in fighting for the rights of her people. 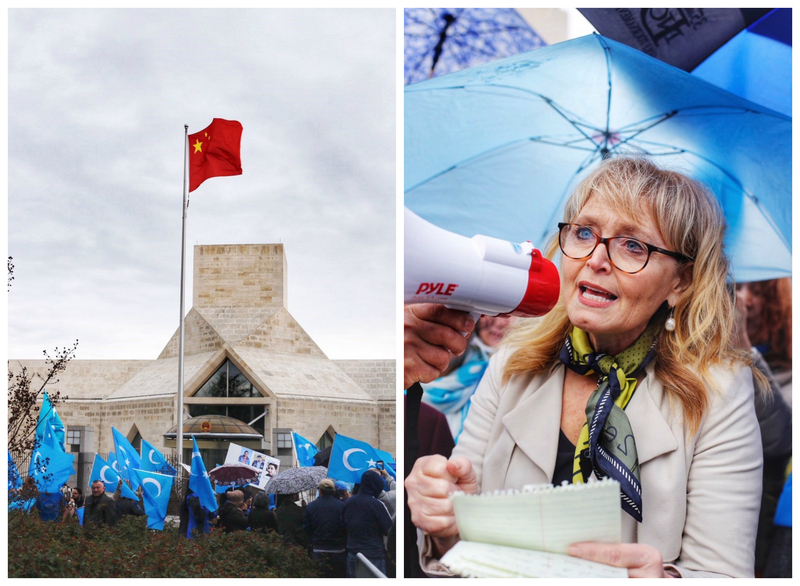 Today let us all commit to stand with Ms. Kadeer and the entire Uyghur Community so that our voices will be heard in the halls of Congress, the White House all the way to Beijing.